Law students at London South Bank University (LSBU) had the chance to put their skills to the test by taking part in a mock trial involving knife crime, with students from Croydon College acting as the jury, witnesses and defendants. The students used their skills and wits to interview defendants and witnesses in order to present a convincing case to the jury – just as they would do in a real courtroom. The Street Law project allows law students from LSBU to pass on their knowledge to school and college students, giving them a greater understanding of everyday legal matters and the potential ramifications of breaking the law. The LSBU participants went through a vigorous interview process with Louise Andronicou, principal lecturer in LSBU's Division of Law, as well as an intense training session by LSBU's senior law lecturer, Tracey Aquino, on the criminal process. Participating in the 'Street Law' project allows the students to develop improved interview techniques and enhanced communication skills which are vital for their future career in Law. Louise Andronicou said: "Street Law is a fabulous project. It motivates and inspires the college students, resulting in many of them progressing to university to study the law. At the same time, it provides our LSBU students with essential skills, such as communication and inter-personal skills, thereby making them even more employable." 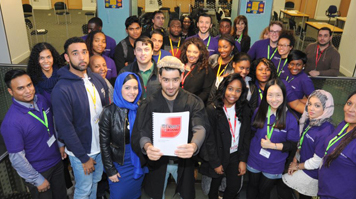 Along with the Street Law project, LSBU's Department of Law – part of the School of Law and Social Sciences - teaches course modules in school and college classrooms - giving students the opportunity to achieve university credits while still at school or college. LSBU provides a free legal advice service to the general public, staffed by law students working under the supervision of practising solicitors. LSBU students also work at Lambeth County Court assisting members of the public with queries.